Jane Quinn rides her bike on a dirt trail. 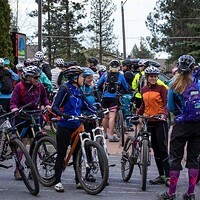 When the Dirt Divas women's mountain biking group started its season in April, over 100 women showed for the first all-ladies group ride of 2018. Jane Quinn, who's been the program director for the past six years, couldn't be there to ride, but was cheering them on from a distance, doing everything she could to make sure the 2018 season was a successful one. "There's not usually that many people," Quinn explained, "but it was the first one since winter ended and people are excited to get back on the trails." If the idea of 100 women mountain biking together seems a little overwhelming, don't worry. Group rides usually include more like 45 or 50 women, spread out over five ability levels. Each group is color coded; green if you've never mountain biked before, yellow if you're a beginner, blue for intermediate riders, red for ladies who like to go fast on advanced trails and orange for advanced riders who like technically challenging trails. Quinn moved to Helena, Mont., last September, so she's been coordinating the Dirt Divas program long distance, as well as continuing her job as apparel buyer at Pine Mountain Sports. Her presence is still heavily felt throughout the program. "I still feel pretty involved—all the planning is pretty hands-on," she said. "But I do miss being there and being able to participate in the actual rides and clinics." Whether you've never mountain biked before or you're an expert mountain biker looking for more riding partners, Dirt Divas has you covered, Quinn said. The free twice monthly rides, held on the second and fourth Mondays, are all no-drop—meaning no rider is left behind—and each group is led by a trained ambassador. After learning how to mountain bike exclusively with men, Quinn wanted mountain biking to be more appealing to women—especially women just getting into the sport. "I worked at a bike shop where I was the only female and I would go riding with my co-workers, but no one taught me about progression, so I would get in over my head and try things I wasn't ready for," she described. "I've heard similar stories from other women who go out riding with their husbands or boyfriends, and I've dealt with the same thing with my husband. He will be like 'just pop over it! ', which isn't actually helpful." The point of Dirt Divas is not to discourage women from riding with men. Instead, it's there to give women a low-pressure place to try new things and improve their skills with people who have similar builds and who may approach things from a similar perspective, Quinn explained. The encouraging but low-pressure encouragement from the group oftentimes creates a place where women are willing to try things they might not otherwise feel up for. Quinn has often seen that self-confidence in riders continue outside of Dirt Divas. 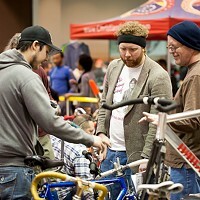 "Our mission is to empower women through bike skills, and bike skills are life skills," she explained. "We see big changes on the bike, like moving from the beginner group to the intermediate group, but we also see women take the self-confidence they've gained into other parts of their lives." In addition to the trail rides, Dirt Divas holds a variety of clinics throughout the season to teach skills such as bike maintenance, suspension setup and kit outfitting, as well as skill-specific clinics. Quinn works with a variety of sponsors, including Osprey, Smith Optic, Camelbak, Trek, Dakine and Club Ride to outfit the ambassadors and to provide prizes and swag for clinics and rides. All rides meet at Pine Mountain Sports. Riders just need to bring a helmet, hydration, a driver's license and a credit card. If riders don't have a bike, they can borrow one from Pine Mountain Sports at no cost.